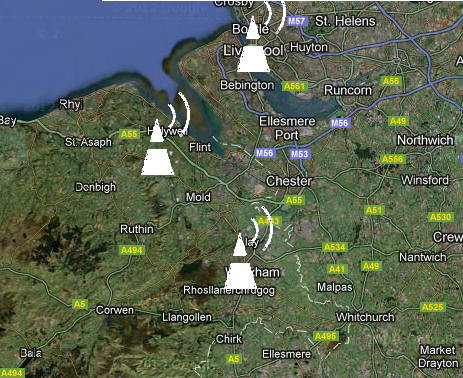 Community station Wirral Radio can now be heard on the Wrexham, Chester and Liverpool multiplex. It's the relaunched 7waves station, which was previously only available on 92.1 FM in a small part of the Wirral around Birkenhead. The launch on DAB means that the station's signal reaches a potential audience of 1.8 million people. The DAB stream is mono, 64kbps. Wirral Radio is also on 92.1 FM, as well as online. In the past 18 months, community station MKFM launched on the Herts, Beds and Bucks multiplex and Redstone FM launched on the Surrey local multiplex. Since the last bandscan:uk, the BBC issued a press release with the latest on the roll-out of DAB radio in phase 4 of the expansion of the BBC National DAB multiplex. In addition to the sites quoted on the DAB phase 4 page of the BBC Reception website, which at the time of publication hasn't been updated, the press release also mentions improved coverage in Chapel-en-le-Frith in Derbyshire (from Ladder Hill since 27th May), plus Church Stretton in Shropshire (Hazler Hill) and Machynlleth in Wales.